We have an extensive catalogue of over 3000 products designed to European Standard. 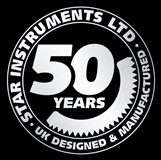 Star Instruments Ltd was formed in 1965 and has gained the reputation as a leading Manufacturer and Supplier of high quality, Pressure, Temperature and Flow Instrumentation. With more than 50 years’ experience, Star Instruments Ltd is synonymous with high quality precision, having held and maintained ISO 9001 Quality Management Accreditation with BSI since April 1989. More recently the company has expanded into the global market place and are manufacturing and supplying sophisticated instruments tailored to the requirements of our customers across the world including Europe, USA, Asia and Australia. The management team of Star Instruments Ltd, continue to drive the growth and development of the company by implementing best practices for business improvement. They are supported by the highly skilled and dedicated workforce whose goal is to offer a high quality solution, which is best suited to our customers’ needs, and backed up by excellent customer service.